Kidney stones are rock-like accumulations that form from naturally occurring mineral salts in the urine and can become lodged in the ureter (kidney tube). Stones that block the flow of urine can lead to serious complications, including damage to the kidney, uremic poisoning, severe infection, and even death. In many cases, formation of new kidney stones can be prevented by simple lifestyle changes, such as drinking more fluids or reducing intake of certain foods. Ureteral stones are rocklike accumulations that form from naturally occurring mineral salts in the urine. Most stones form in the kidney and migrate into the kidney tubes or ureters. The typical patient with urinary stones is a 40- to 50-year-old white man with a family history of urinary stones. 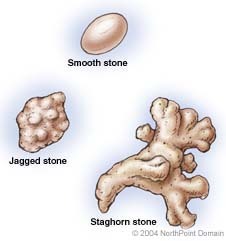 Urinary stones can be round or irregular, relatively smooth, or have jagged edges or projections. The color of urinary stones varies according to their chemical composition. Stones can remain in the kidneys for years without causing problems. Stones form when the naturally occurring mineral salts in the urine accumulate and become lodged in the ureter. Calcium stones: The most common form, calcium stones occur when there is too much calcium and/or oxalate in the blood. Taking certain drugs or too much vitamin D can increase calcium concentrations. Genetics or a diet high in oxalate-rich foods, such as spinach, can elevate oxalate levels. Uric acid stones: Excess uric acid, a byproduct of protein metabolism, can crystallize to form stones. Struvite stones: Struvite stones are created by bacteria that infect the urinary tract more commonly in women. Cystine stones: These rare stones occur in people with a hereditary condition that causes the kidneys to excrete large amounts of certain amino acids. The first step during medical evaluation is a physical examination intended to locate the exact source of any pain or discomfort. Other diseases that produce symptoms similar to ureteral stone disease must be considered and eliminated. Intravenous pyelogram (a medical dye is injected into the bloodstream to provide visual contrast on the x ray, allowing the physician to clearly see the stone and assess the degree of obstruction). In many cases, small ureteral stones eventually will harmlessly exit the body on its own. Patients are often prescribed pain medication and instructed to drink as many as 12 to 16 glasses of fluid a day during the waiting period. An expelled stone should be captured, if possible, to allow analysis of its chemical composition.